The POT LUCK design brings the renown New England lobster boat within the capabilities of the competent amateur builder. Our modern building methods, coupled with proven materials, make building the characteristic round bottomed hull form much easier than traditional methods more suited to professionals. These easily driven, smooth riding hulls with fine entries and long, flat running lines aft, make money saving sense in these days of increasing fuel costs and threats of fuel shortages. That's why our designers included generous sized tanks for plenty of range. For reliability, there's a long, deep skeg to protect the rudder, shaft, and propeller, while at the same time assuring good directional control. Everyone knows of the traditional beauty of these hulls, and our POT LUCK is no exception. Flaring topsides forward are not only attractive, but when coupled with spray rails, these hulls stay dry and have an easy motion when the going gets tough. Use her for a yacht, sport boat, or even commercially. That huge cockpit adapts to a wide variety of uses including sportfishing, diving, various types of specialty fishing (such as lobstering, crabbing, oystering, scalloping or gillnetting), or anywhere you might need a quick, nimble, seaworthy, and economical craft. The cockpit is self-draining and watertight, with a sub-surface drain system for hosing down, and you won't need to worry about covering it if you don't want to. Unlike some stripped-out utility boats, we made the cabin area yacht-like for comfort. Berths are provided for three, and there's plenty of seating area. The cabin features full headroom with plenty of lockers, drawers, and a hanging locker. The galley is complete and the toilet room features a shower and lavy. The control station is covered and protected, with engine and bilge access readily at hand through centerline hatches. 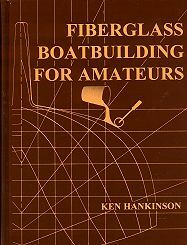 Hull construction is either by wood or fiberglass, with separate plans available for either material. For WOOD construction, the plans show a hull built over temporary forms which do not remain in the hull. However, a series of full and partial bulkheads, floor timbers, and motor stringers later installed reinforce what amounts to a virtually frameless "monocoque" hull that is strong, but light in weight. Planking is by the conventional strip plank method (seen in numerous boatbuilding books and used for generations), or cold-molded using a combination strip planked inner core with solid wood veneers applied triple diagonally on the outside, all epoxy glued with fiberglass sheathing over. Hull thickness either way is a minimum of 1-1/8". The FIBERGLASS version details "one-off" methods, either with the fiberglass planking method (C-FLEX), PVC foam core, or Balsa core in conjunction with fiberglass laminates. Regardless of the method used to build the hull, the cabin, cockpit, and deck are made from wood and plywood in the conventional method, sheathed on the outside with fiberglass for low cost, simplicity, and durability. For those who may want to change the length of the boat, a simple method is given in the instructions to vary the length plus or minus 10%. While a Table of Offsets is provided with the plans for those who may want to loft the lines, the full size patterns provided make this tedious job unnecessary. Voluminous instructions plus hull material listings included with the plans greatly simplify the building of your own POT LUCK, giving you a custom boat at a cost far less than a comparable stock boat of this type, if there even is such a thing!